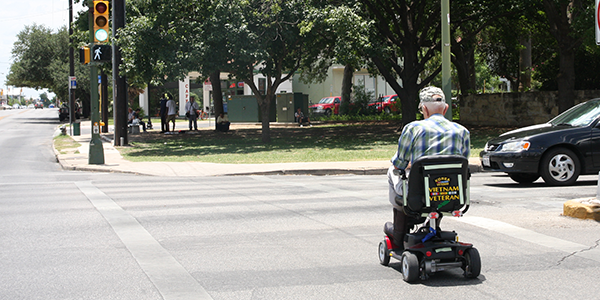 The Pedestrian Mobility Advisory Committee (PMAC) advises the Alamo Area Metropolitan Planning Organization (MPO) Transportation Policy Board on pedestrian issues for the metropolitan area. PMAC's goal is to plan for safe, effective and accessible network of sidewalks and pedestrian amenities throughout the region. PMAC is comprised of agency staff members and interested citizens, including the mobility impaired community. When: Third Wednesday of the month at 3:30 p.m.
* Meeting dates, times, and locations may vary. Please confirm the meeting information with the agenda posted on our website or by calling us at 210.227.8651. MPO meetings are accessible to persons with disabilities. To arrange for special assistance or an interpreter, please call 210.227.8651 or TDD 1-800-735-2989 (Relay Texas) at least five working days in advance. Las reuniones son accesibles a personas con discapacidad. Si usted necesita asistencia especial o un intérprete, llame al (210) 227-8651 o al TDD 1-800-662-4954 (Relay Texas) con cinco días hábiles de anticipación.